FILE - A worker checks the production of Havana Club rum at the company's factory in Havana, Cuba. U.S. President Barack Obama's administration announced Friday the easing of restrictions on Cuba in an attempt to create more economic opportunities between the two countries. The administration approved a package of regulatory changes that is intended to expand scientific, humanitarian, trade and commercial opportunities between the U.S. and Cuba. 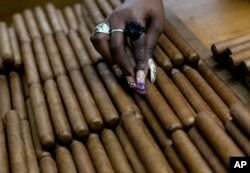 FILE - a worker selects cigars at the H. Upmann cigar factory, where people can take tours as part of the 15th annual Cigar Festival, in Havana, Cuba. The administration's plan is intended to promote joint medical research between the two countries, the sale of Cuban pharmaceuticals in the U.S. and banking opportunities for Americans in Cuba. Humanitarian-related initiatives involving scholarships for scientific research and improving Cuba's infrastructure will also be expanded. The changes, which will take effect on October 17, are another step in President Obama's plan to normalize relations with Cuba.